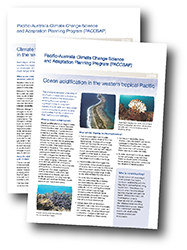 We developed a series of fact sheets explaining important aspects of climate and climate change in the western tropical Pacific. These fact sheets can be downloaded from the list below. A Pacific Climate Change Science Program brochure produced for COP 16, United Nations Climate Change Conference, Cancún, Quintana Roo.